V6-1 – Nürburgring in 6:57? Is it true that the C7 ZR1 lapped the Nürburgring in 6:57 and the C7 Z06 in 7:10? Well a photo, allegedly posted by Jim Mero’s wife Terri, on Facebook shows a collage of Jim allegedly driving several different Corvettes on various tracks. 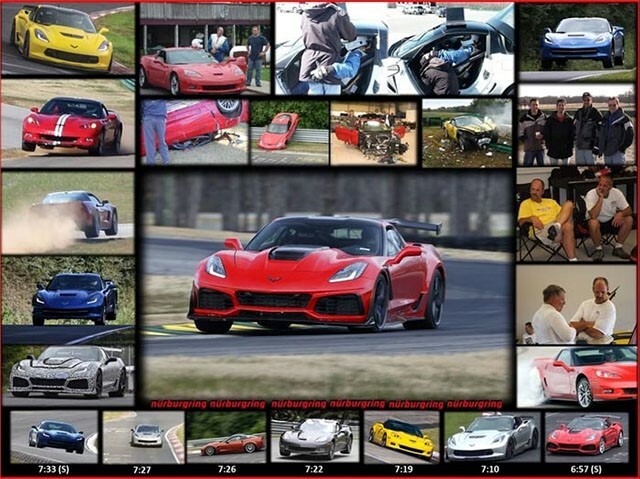 Since Jim just retired as the ride/handling engineer and test driver for the C7 Corvette team, this collage seems to be the perfect retirement gift. Interestingly, the numbers underneath the photos seem to be the lap times at Nürburgring; most of which have never been officially announced!! Clever Terri. It is not clear what the (S) means, however, some people are speculating that they may mean the time was calculated using the best segment times instead of one single lap.